Some days, it feels like we're trying to chase down something elusive. But today, I was part of an actual wild goose chase. When I arrived for my work shift at Ashland Nature Center this morning, I discovered that a wayward gosling had followed around one of our school groups on their morning hike. They tried to leave him down in the marsh, where he would be most likely to be found by his parents, but the little one stuck like glue to the group and finished the hike with them. He dined on the fresh plants surrounding the lodge while they ate their breakfast inside. Since I was leading the next program down in the marsh, I took the gosling with us and hoped to leave him there. I asked the students to refrain from talking to or touching the goose, as he needed to stay wild. There was no sign of any adult geese in the marsh or the creek, much to my disappointment. The gosling contentedly swam around, munching on duckweed while we explored the marsh. As we tried to sneak out of the area quietly, he came excitedly chasing after us, calling as loudly as he could, which amounted to a muted squeak. 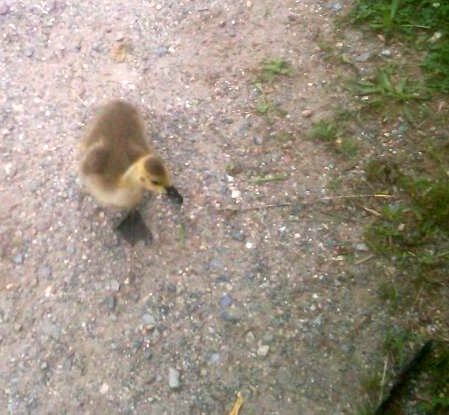 Truth be told, it's insanely cute to watch a gosling chase after you and try to catch up, wobbling to and fro on his webbed feet and flapping tiny wings that don't have flight feathers yet. But it was very concerning to me, as there were no signs of his parents and he was clearly content to hang out with us, which is not normal, nor good for him. He needs his parents to learn how to fly, eat, and all other manner of bird-being. While I am a mother and enjoy nursery rhymes, I am not a Mother Goose. He followed us with earnest dedication for the rest of the program. While I showed some aquatic animals to the kids, the gosling roamed the area, tasting the various grasses. When we headed to the stream, he followed us across the parking lot and enjoyed a brief swim in the cool water. We made the long trek across the street and covered bridge to the pond, where I had to stop traffic longer than usual so he could cross the road safely. He followed along as if he were one of the kids. The students all looked out for him, but were cooperative in not touching or otherwise interacting with him as I had requested. When we finished our program and headed back up the steps to the lodge where we had met the gosling, he followed us, tentatively working his way up the hill next to the steps. The kids headed inside for lunch, and the gosling found some more grasses to chow on outside the door. I was unsure what to do, as I had not seen geese in any areas where I had been, which were the areas at Ashland where they tend to hang out. I looked at him to see if he was going to follow me, and as soon as I started to head down the hill to the steps, he quickly came after me, squeaking as if to say, "wait up!" He bounded down the first step with a thump, half trying to fly and looking slightly surprised. 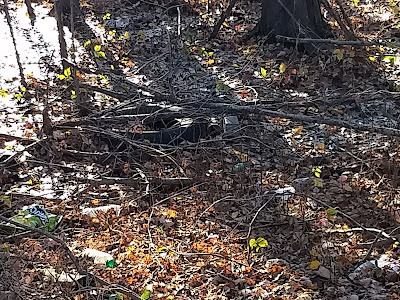 He decided that wasn't going to work, and skirted around the edges of the steps and onto the steep hillside, sliding a bit at a time and working his way through some thicker areas of foliage. It was a slow descent, but we finally made it down to the main building. Excited to see new plants, he began browsing the area. I started to go into the building when he came running after me. I held the door to see if he would enter, but he wasn't sure about that. So I closed the door, with me on the inside and the gosling on the outside. While he definitely didn't want to come inside, he surely did not want to be left outside alone. He started flapping his little wings, standing up as tall as he could, and I could see his open beak calling to me. I stepped back outside and sat on a bench to wait for my supervisor and colleague so we could decide what was best for this little guy. He went back to eating while we waited. We called Tri-State Bird Rescue for some advice. They suggested we bring him in, as we had already made several attempts to return him to the marsh and there was no sign of his parents. My supervisor grabbed an animal carrier, and I ran inside to grab my car keys and wallet while my colleague stayed with the gosling. By the time I got back outside, the gosling was in the carrier. Apparently, the moment I went in the building, he stood right outside the door calling for me again. I sighed and headed to the car with the carrier in hand. Then all of a sudden we heard some adult geese honking. My colleague and I went up the hill in the direction of the goose call, hoping to reunite the little guy with his kin. We didn't find them, and decided to make one last loop around the marsh and Red Clay Creek just in case his parents had flown in. We walked all the way to the back of the property and across the street. No geese at all. At some point in our journey through tall grasses, I realized we were actually on a wild goose chase. The gosling chased me all morning, and now we were on an elusive search for his parents. We weren't able to find them, so I drove the gosling to Tri-State Bird Rescue, having to stop myself from talking to him the whole way there. He squeaked quietly at me a few times, but spent most of the car ride preening his feathers. I took him inside and relayed our adventures. The receptionist said that it sounded like we had done everything we could and thanked me for bringing him in. I was saddened a bit that we couldn't find his parents, but he will get loving care there and maybe they have some other geese who can teach him all the birdly wisdom he'll need. (Tri-State is a great organization, and it costs a minimum of $50 to care for an abandoned or injured bird. If you feel moved to make a donation or would like to learn more about what they do, please visit their website). As for me, this was the best wild goose chase I've ever been on. Thanks for spending the day with me little one, and may you grow into a beautiful, healthy bird and maybe work your way back to Ashland for a visit sometime. We'd love to see you!